Saturday- We had a nice breakfast with Nancy and Dave, then worked around the MH for awhile. Then we all had leftover Chinese from dinner last evening for lunch. We took a nice nap, and waited for John and Lorrie Anderson to arrive. They became stuck in traffic around New York, so they did not arrive until around 8 PM. We celebrated Lorries birthday with a nice ice cream cake and all went to bed early. Sunday- We had another nice breakfast with everyone. We packed up and went into Stowe for the day. We stopped at an art gallery and looked at some awesome art, primarily by a Vermont artist, Fred Swan. His pictures are beautiful Vermont scenes. We continued into Stowe and stopped at the Sunday Farmers Market. We did not purchase anything, but it was fun to look. 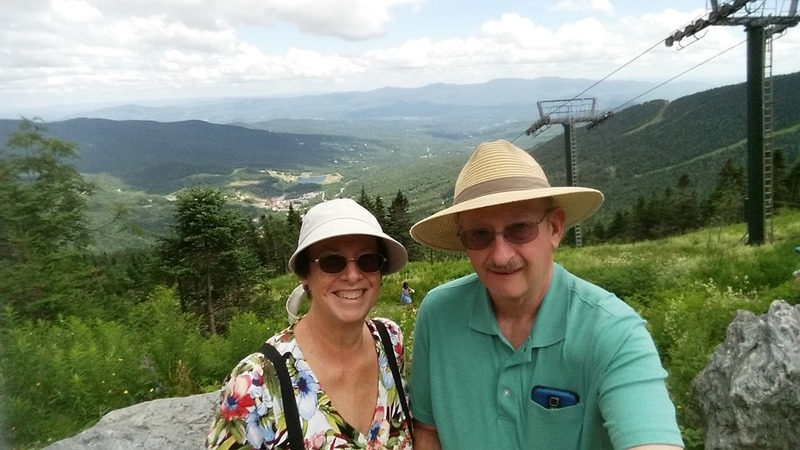 We continued on to Stowe Mountain, where we wandered around looking at the many changes to the resort. Then we took the gondola to the top to view from above. They were running a zip line so we watched the people go flying down the mountain. 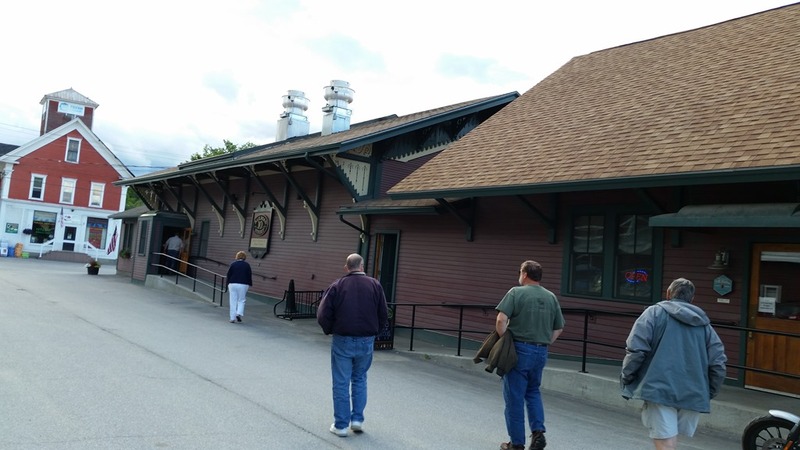 We returned to the car, and drove through Smugglers Notch to the town of Jefferson, where we stopped for Creemees. This seems to be a Vermont tradition, as there are Creemee stands everywhere. Bob and I both had a small maple Creemee. We returned to Nancy and Dave’s house and watched a show that they had recorded from the Smithsonian Channel, “Above America”. We fell asleep watching so we went to bed. Monday- Another nice breakfast with everyone, then we left to go to Newport VT. We had lunch at a favorite restaurant in town, the Eastside Restaurant. We had been there before and enjoyed the experience. The restaurant is located right on Lake Memphremagog, which is partly in the US and partly in Canada. We had to turn off our phones as they kept trying to roam back to Canada! After a great lunch, we wandered through the gift shop, then returned to Nancy and Dave’s house.There was a Town of Hyde Park ice cream social, so we loaded up John and Lorries car, again, and went to the social. It was very nice, located in the top of a barn. 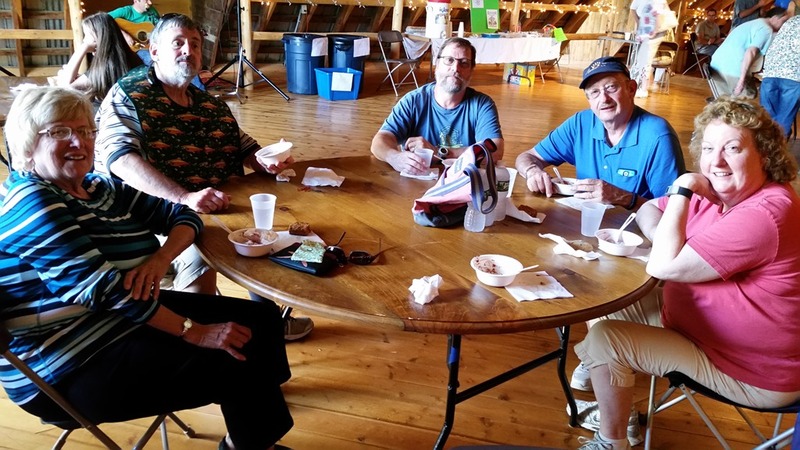 We had a nice time visiting with our friends and eating ice cream and cookies. We returned to the house and we played Mexican Train until it was time to go to bed. Tuesday- Dave had to work today, so after a late nice breakfast the rest of us went into the town of Stowe to wander around and go shopping. We ate lunch at The Malt Shop and wandered through all the stores. 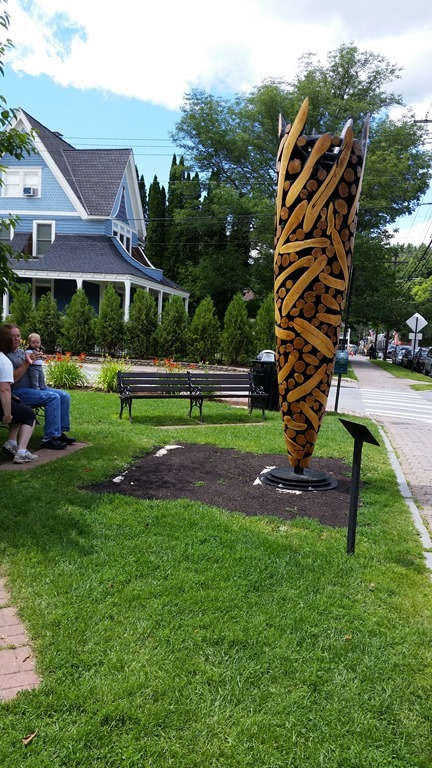 Below is a nice sculpture in town. We returned to the Shambaugh’s and everybody fell asleep. We went to dinner at 10 Railroad Street, a nice little restaurant. We felt sorry for the staff, as they were swamped on a Tuesday evening. We each had the scallops appetizer, which was scallops, wrapped in bacon, and cooked in a mason jar. Very good! Plus Bob and I split an order of nachos. We returned to the Shambaugh’s and watched some TV. Everybody said their good-byes, as the Andersons were leaving early in the morning. Nancy was also leaving early to go back to work. Wednesday- We did not rush getting ready to leave, as we could not check in at the next RV park until after 1 PM. We left around 10:30 and drove west on Hwy. 15 to Essex Junction. We turned north on I-89 and stopped at a Mobile station for diesel. This is the closest thing that Vermont seems to have for a truck stop. We returned one exit south and drove into Lone Pine Campsites at about 1:05. We settled into our site and ate lunch. We tried for satellite TV, but there were trees in the way. We were lucky to get a site, as it is close to the Escapade and it has been full the entire time we have been here! We were just getting settled and people were waving and saying hello. We went to Walmart for some groceries. Burlington has only one Walmart and it is not a supercenter. We stopped in at Costco, which is also a very small Costco with no gas station. We returned and the folks across from us, who have two small dogs also, stopped by to say hello. The resort is full of friendly Escapees! We ate dinner and watched some recorded TV shows. Thursday- I was able to get out and walk this morning. It was not too humid and the road is paved. I worked on an article that my editor had sent me and Bob worked on cleaning the bikes, as we will be using them for transportation at the Escapade.. I had a 10:30 mani/pedi scheduled and I went to have that done. We ate lunch when I returned and then went to drive the route to the Escapade. We followed their directions, then found a doable short cut. We went to Kohls for some clothes. We returned to the MH and sat out reading. I rode my bike around the park before Bob put the bikes on the back of the car. We ate dinner and sat out until it was too dark to read, then came in, watched some recorded TV and went to bed. Friday- We were up early and took nice long showers. We will have electric and water this week, but no dump, so we have to do shorter, sailor showers. I did one last load of laundry, after Bob dumped the tanks, and while we could have the gray tank open to sewer. We use the shower water to rinse the hose, so Bob opened the tank back up. Then we packed up to leave. It was a short drive, about 15 minutes to the Expo Center. We had driven a back road yesterday and took it today, since we knew we could drive this route. The way that the Escapees had us going was longer and we had to go south in I- 87 to exit 14 and basically make a U-turn and drive back to Exit 15 and drive surface streets anyway. We arrived to cheerful waves from the parking volunteers. We drove through the Expo Center, about 1/2 to 3/4 miles, being waved on by the parking staff. We ended up parallel to the entrance, on the other side of the facility, facing the main road, between gate A and gate B. We have plenty of room between RV’s and are hooked up to 30 amp service and water. Wow is it hot! I had woken up at 3:30 for some reason and I konked out at 11. I had to lay down and take a nap. I woke up at 1, because the fan was off. We had lost electric. Awful! Bob found a parking person and he called it in. We had no electric for about an hour and a half and it became really hot in the MH. The guy on our passenger side was able to connect to a different pedestal. He had electric, but we are in the middle and cannot reach another pedestal. The problem was that the box with the breakers was locked with a padlock and they had to find the key. They finally did and moved the other folks off this box. We are now the only people on the box. So we turned on the air and tried to get the temp back down in the MH. It never really got cool enough until after dark. The temp at the MH was 100 outside. We were 87 inside, although the weather person said it only reached 87. Even with being the only ones on the pedestal, we could not run the basement air and the roof air, which we normally can do on 30 amp, so we had to be very careful. When running the microwave, we had to turn off the air. We were able to run the Breville with the air going, so we baked some salmon for dinner. It was too hot out to BBQ. We had a quiet afternoon. I worked on getting ready to work the table with Janet, my Executive Director with the weight loss plan I am on. . Hopefully I can help others to get healthy and lose weight like I have been doing. We started to watch TV and there was nothing on. So I tried to connect the TV to the internet so that I could watch shows that we missed over the last two days. The TV would not connect. So Bob called Direct TV and we had to reboot the Direct TV system, then we could watch. While he was talking to them, we asked about the Direct HD package, which contains The Smithsonian channel. We had watched shows on it at the Shambaugh’s and really enjoyed them. So we were interested in adding the channel. It is part of a package of movie channels. It costs an extra $4 per month so we added it. We were able to watch “Above America” the Wisconsin episode. It was very good and we learned a lot about Wisconsin that we did not know! We have planned to go back to see more of Wisconsin and Minnesota in the future.